Beiguan Church had humble beginnings with twenty members meeting in someone’s home. Later, they shared a church in downtown Shenyang, later rented a church and finally had enough savings to build their own four-story building. The young man looked left to make sure that he was perfectly lined up with his coworkers. Then he straightened his tie. “We have been looking forward to this visit from Adventist church leaders for a very long time,” student Elisha Ding said. Ding is one of over one hundred young people being trained for ministry at the Beiguan Adventist Church in Shenyang, in the northern Chinese province of Liaoning. Dressed in black suits, young men and women lined the walkway singing songs of welcome as a delegation from Adventist world church headquarters walked towards the church for evening worship. 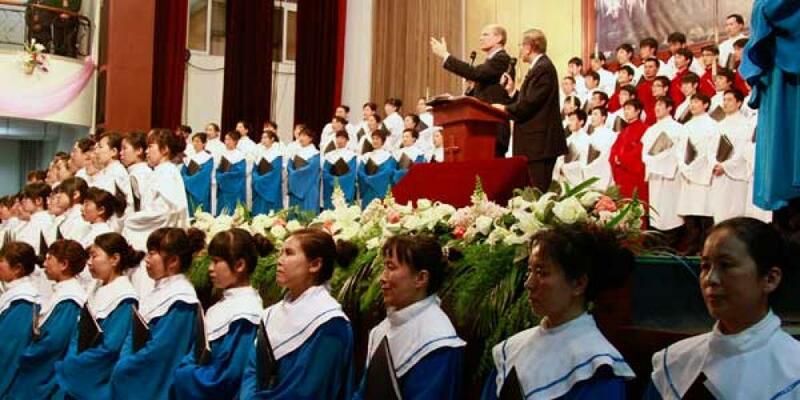 Led by world church President Ted N. C. Wilson, the delegation was on an official ten-day visit to China to meet church members and local leaders. “The foundation of the Beiguan Church is based on service and sacrifice,” said Adventist world church Secretary G. T. Ng. “This church needs an enormous number of workers to run these church plants because they don’t have a formal church system,” he added. Young people are trained for one year and during this time are given various responsibilities by their supervisors. After one year the best students are hand picked for additional theological training. Some students are also sent abroad as missionaries to various countries. “All our students are self-supporting and need to fund themselves,” said Hao Ya Jie, church and school leader. Many members took savings that they had kept for their children’s education and donated this to the church. People also gave much of their retirement savings. With winter approaching, construction workers needed to pour the concrete for the main pillars of the church in time to prevent cracking. “The concrete had just been poured when a cold front passed causing great concern,” said Chinese Union President David Kok Hoe Ng. “Most church members brought their blankets from home and wrapped these around the pillars to save the building. It was quite a sight to see all these brightly colored blankets,” he added. Today, the Beiguan Adventist Church has more than 3,000 members and has generated numerous church plants totaling another 7,000 members. Every morning at 5 a.m., 365 days a year, church members come to the church to pray. “The winters in the north are very cold and sometimes there are not too many people, but there are always at least one hundred members praying every morning,” Ng said. Wilson reminded church members that God is calling them to carry on the work of revival and reformation. “You are a vital part of God’s worldwide people who are moving towards the Second Coming of Christ, a destiny that Christ himself has provided,” Wilson said. The day before, the delegation visited the cultural city of Hangzhou, where Wilson greeted church members at Meilizhou Church inside an upmarket resort development. This church also came about through sacrifice and the commitment and vision of key church members. A church elder and businessman saw an opportunity and contacted a friend who was a property developer. He told him that his resort had almost everything but one important element – a church. The church elder contributed 25 percent of the funding and the developer paid the rest to build a church centrally located in the upmarket resort. Meilizhou Church’s membership is growing steadily as it serves the surrounding community. "It is incredible to see the way our members are sacrificing their time and means to move forward the work of the Lord," said Adventist world church Treasurer Robert E. Lemon. "To see how our members have been able to build such a strong and vibrant church based almost completely on local volunteer support is thrilling." The churches in China are a testament to God’s blessings when members are willing to sacrifice time, talents and money.